“A precedentÂ was set in 1966 when Geoff Hurst was picked ahead of Jimmy Greaves for the World Cup final. Greaves had gone into the World Cup as first choice, but suffered a nasty gash on his leg, ruling him out of the quarter and semi-finals. Hurst, who had presumably only been included by Alf Ramsey as an alternate option to Greaves and Roger Hunt, was thrown in against Argentina and scored the only goal. With Greaves fit again for the final, there were loud calls for the return of Englandâ€™s most prolific striker from the press, yet Ramsey held strong and Hurst scored the only hat-trick in a World Cup final. Universality breeds universality. If you have 11 players who are able to score goals, the opposition will be at a disadvantage unless they have 11 players who can defend them. You can break a teams up into set parts, with attackers attacking and defenders defending – Arrigo Sacchi, perhaps the greatest advocate of universality, would set up training drills at Milan with eight attackers against four or five defenders and the defenders would usually win – but that creates its own problems in being too predictable when trying to score goals. In the current football world, there are few opportunities for those who offer little other than finishing ability and good positioning or timing. In fact, it’s now becoming more acceptable for a striker not to offer any goals as long as they offer something defensively or creatively. Emile Heskey, for example, does come in for a lot of criticism for his lack of goals – the statistic doing the rounds about Paraguayan goalkeeper Jose Luis Chilavert scoring more international goals than him was particularly damning – but the perception of his role has changed. Heskey insists that he hasn’t got worse or better than earlier on in his career, just that his role is perceived differently, “going in and out of fashion” as The Times’ Joe Lovejoy put it. However, no matter how Heskey’s role is seen, it’s always useful for the team, a poacher’s isn’t. Even Rooney has been credited for this type of work this season to excuse his lack of goals. This has extended to fans now revising the roles of forwards in the past, such as Serginho in the Brazilian side of 1982 or French World Cup winner Stephane Guivarc’h in 1998. Serginho and Guivarc’h were understandably derided for their lack of technical ability, but they worked hard and gave their respective sides a focal point. Strikers are still mostly the main source for goals of course, the likes of Fernando Torres, Didier Drogba and David Villa simply have more strings to their bow than just goals, but then neither of the most impressive goalscorers at the moment, Lionel Messi and Cristiano Ronaldo, are strikers. A large part of this could well be their positioning – by playing deeper, Messi and Ronaldo are generally up against players who, to simplify, are either worse defensively or have more attacking impetus than most central defenders. So, with this in mind, is it possible for the poacher to function in midfield? Thinking of successful players over the last few years whose main attributes match a stereotypical poacher, such as finishing and timing, quite a few are midfielders. Tim Cahill, Kevin Nolan and even Frank Lampard all offer more than just goals but it could be argued that’s their main benefit – they each have this ability to ghost into the box from deep and finish moves. Although their primary purpose is to create space for others and help build-up play, false nines have also had some pretty impressive goalscoring feats to their names: for instance, Francesco Totti picked up the ESM Golden Shoe for the 26 league goals he scored in the 2006-07 season and Carlos Tevez has scored 49 goals in 69 games for Man City. The most obvious example of why this works is that players are generally harder to track from deep; it’s generally not the defender’s job to pick up a midfielder – and for good reason (Terry picking up Ozil if that isn’t obvious) – and a midfielder is reluctant to drop that deep, and even if they are not, they are likely to be lagging behind the deep runner since their move is reactionary to his run, giving him the advantage. The best strike partnerships worked on the movement of one of the strikers opening up space for the other, but if the other player is coming from deep they have the element of surprise and the momentum of running forward, such as in Stuart Holden’s winning goal against Blackburn earlier this year or Steven Gerrard’s against Everton in 2009, plus since the runner is an extra man in midfield, making it easier to press and dominate possession even if the player isn’t necessarily that good at it. 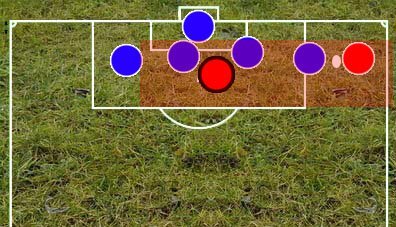 Poacher-style positioning in cross from right – defenders’ vision shaded red. Poacher is easy to track. Positioning of a deep runner in cross from right – can hover round edge of box outside of defenders’ vision or slip between defenders late so they don’t have time to adjust. In theory some of those specialist goalscorers could fulfil the same role, only deeper, hovering around the defensive midfielder rather than the shoulder of the last defender, while adding something else defensively if only through positioning. Interesting points, particularly about the defenders not being aware of the run from deep compared to a poacher. The advent of the lone forward and the false 9 has made life more complicated for centre-backs for sure. Last time I noticed more cases when it’s done by holding midfielders also (for instance, in game of Shakter, Chelsea (Essien), Arsenal (Song). The forward opens the zone (right or left from the goal posts usually) for sudden burst of partners from deep. As for holding midfielders, there are some additional advantages: their run in attack is more unexpected; rarely somebody close them down attentively compared to attacking midfielders.